DETAILS: Spend your next vacation at this fabulous, gulf front condo tucked away in serene Blue Mountain Beach off of Scenic 30A. This freshly painted, newly decorated 2200 square foot condo offers four bedrooms, three bathrooms and impeccable accommodations for up to ten guests making it the perfect spot for a family getaway. Entertaining will be a breeze as this condo offers an open floor plan that includes a fully equipped kitchen, dining area and living room that leads out to the gulf front patio. Adagio's community amenities offer endless days of fun in the sun as the private beach access, heated gulf front, infinity edge pool and three-tiered pool at the center of the complex are all just moments from your front door. When you're ready to explore the surrounding 30A area, be sure sure to check out the premium shopping and dining venues in neighboring Grayton Beach, WaterColor and Seaside. This adagio unit comes with two parking spaces Check availability and book with 360 Blue today! AMENITIES INCLUDE: Private balcony, two community pools, gulf views. This property comes with 2 dedicated parking spots. Additional parking can be found throughout the community. Complete Clean Linen Participant - ALL linens, including comforters laundered upon every checkout. We had a wonderful stay in A402. It met all of our expectations and the property was fantastic and clean. The beach was perfect although we were fighting a little red tide, but it didn't slow the group down. The beds were very comfortable and the condo was very quiet, no neighbor noise, but a nice sound of the ocean. Unlike many rentals, the pots and pans were fairly new and in very good condition. We enjoyed our stay and would definitely go back. What a breathtaking photo you shared with us! We are so glad that you enjoyed your stay with us in Blue Mountain Beach at the Adagio! We agree that these condos are amazing and this one, in particular, is a wonderful option to enjoy the beach as well as 30A for your vacation! We hope to host you all again very soon! We are so delighted that you enjoyed your stay with us in Blue Mountain! We agree that these condos are a wonderful option for a fun and relaxing beach getaway and the accommodations of the Adagio units are second to none! We hope to see you again soon and hopefully for a longer trip this time! This is our second year in a row that we stayed in A402 and we love it. We had 5 adults and 3 children and the accommodations are perfect for our needs. Hope to do it again next summer. 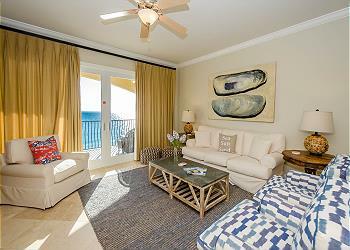 We are so glad that you and your family had yet another wonderful vacation with us in Blue Mountain Beach at Adagio! We agree that this condo is more than accommodating for everyone and you can not beat the location! We hope to see you all again very soon! The condo was beautiful and spacious. We had 4 adults and 6 kids, with plenty of room. Balcony is big with an amazing view. The complex is easy to allow kids to head to the pool alone (if old enough). I give a 4 star rating due to no Wi-Fi and lack of tv stations. When weather is challenging Wi-Fi is a must for kids and adults with work obligations. We called the property management team and they were very responsive to come and investigate the Wi-Fi, with no avail. Overall, this was a wonderful place and would love to stay again. We are pleased to hear you had a great vacation! The Adagio units are hard to beat. We have shared the inconvenience of the wifi with our team and will work hard to make sure this is corrected for future guests. We hope to see you again soon! Wonderful stay at Adagio. The property is perfectly located. Our party of 8 enjoyed biking and running the public paths. I'll have to say the unmatchable beach of this coast is the highlight. Watching a glorious sunset every afternoon is a gift we were thankful to enjoy. What a great family photo! 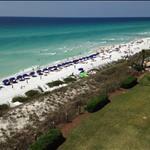 We are thrilled that you enjoyed your fall beach getaway at Adagio. We hope to see you back soon! Our family of eight, now adults, had a splendid stay! The condo, the beach, the water...were terrific...we will be back! What a beautiful day to spend at the beach! We are thrilled you enjoyed Blue Mountain so much! Thank you for staying with 360 Blue and we can't wait to have you back on 30A again soon! Our family has taken a summer beach trip for almost 30 years. 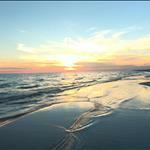 We most often for the Carolina Coasts, but have ventured to the Gulf Coast a couple of times. We generally tent houses, do we were a bit skeptical about the condo experience. However, our rental condos were superb! The rooms are spacious, beds comfortable, appliances worked well (particularly liked the gas stove! ); the complex was quiet (serene,) the views were spectacular and the staff were friendly. We are considering a return trip in the next year or two. We truly liked the Adagio!! We are so happy you and your family had such a wonderful time on the gulf coast! Thank you for choosing to stay with 360 Blue and we hope to have you back again soon! Great vacation with grandchildren Enjoyed the property. What a precious photo! This looks like a memory that will be treasured forever. Thank you so much for choosing 360 Blue for your family's beach escape and for taking a moment to share your experience. Be sure to come and visit again soon! We absolutely loved the condo!! Couldn't believe how comfortable the beds were! Absolutely no complaints! The view is amazing and there are so many great restaurants in the area. What a beautiful and memorable photo! We are thrilled you enjoyed the condo so much and you for sure can't beat those views. Thank you for staying with 360 Blue and we can't wait to have you back again! We had a great week at the beach staying at the Adagio! My inlaws came in from Arkansas and have now declared this there favorite beach to visit. Thanks for making it a wonderful week for my family. We will miss walking the beach and sitting on the porch at night to listen to the ocean...I guess we will have to come back!! What a breathtaking photo! Adagio does have some of the best sunsets around. We are so happy that you and your family had such a great week. Thank you so much for staying with 360 Blue and be sure to visit us again soon! We had a wonderful week in A402. We have stayed at Adagio for 5 years now and have loved it every time. This condo is beautiful, very well furnished and has gorgeous views. We look forward to our next stay. 360 Blue was great to deal with. Great communication and accessibility. Love the app will all the information in one place! Highly recommend!! Wow! This photo is stunning! That’s the one for your computer background so it’s there whenever you need a little beach in your day. We couldn’t me more happy that you have chosen us for this year’s escape to the beach! Thank you again for choosing 360 Blue and come back and visit us again soon! Great family friendly condo complex. Unbeatable views, very nice pools for change of pace from the perfect beach. 402A is a terrific unit. Fully equipped all Viking kitchen, brand new cuinart cookware, ample glasses, dinnerware etc. dining room table seats 8. 3 chairs at breakfast bar. 360blue provides great service. Thx to Tabatha, Mandy and Whitney for helping me make the right choice and for their patience with ally questions. Flipper Adventures gave us a dolphin cruise with more up close encounters than we could count. Kids loved crabbin' after dark. Great view of the gulf! Adagio community pools are a few of the best along 30A! We are happy you enjoyed the unit and everything is has to offer. Thank you so much for your feedback. We are happy to hear our reservations team was of great help to finding you the perfect fit! Come back again for more wildlife excursions and adventures! !